It’s Rockman’s birthday this Friday! Our blue bomber is turning 23 on December 17. It should be fun to see what Capcom and the many Mega Man fan sites do for the occasion. 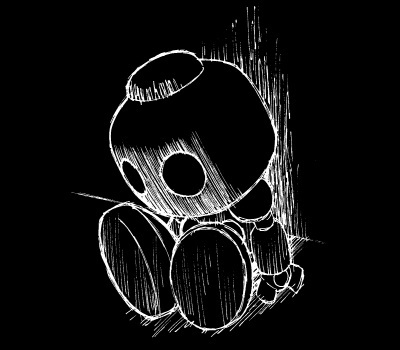 I actually didn’t have anything special planned, but I’m thinking I ought to do something, right? 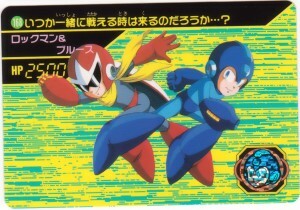 So here’s what I came up with: I’ll be posting an image or two from Rockman’s Carddas card series each day this week. Rockman Birthday Countdown, Go! Today’s theme, the Rockman Family! 210. With everyone’s power together, we’ll protect the world from the clutches of evil! 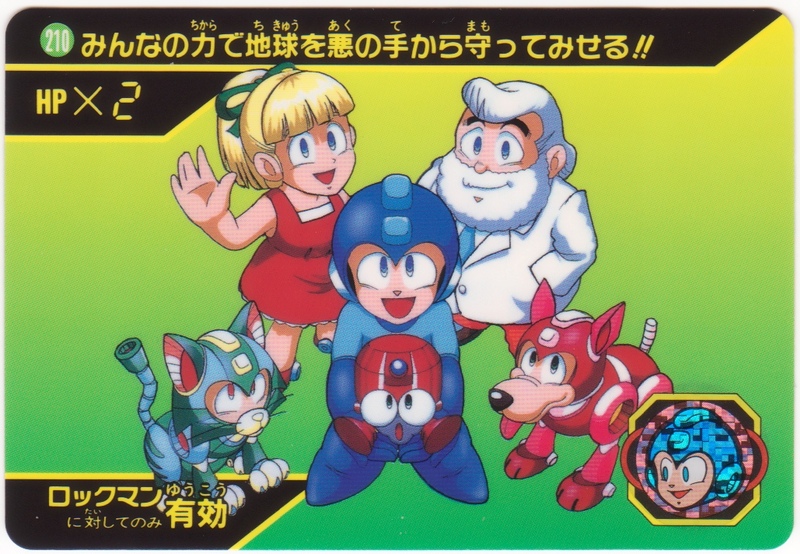 Since that picture is from the Rockman World 5 set, a few friendly faces from Rockman’s core support group are missing from that image, like Beat and Rightot. 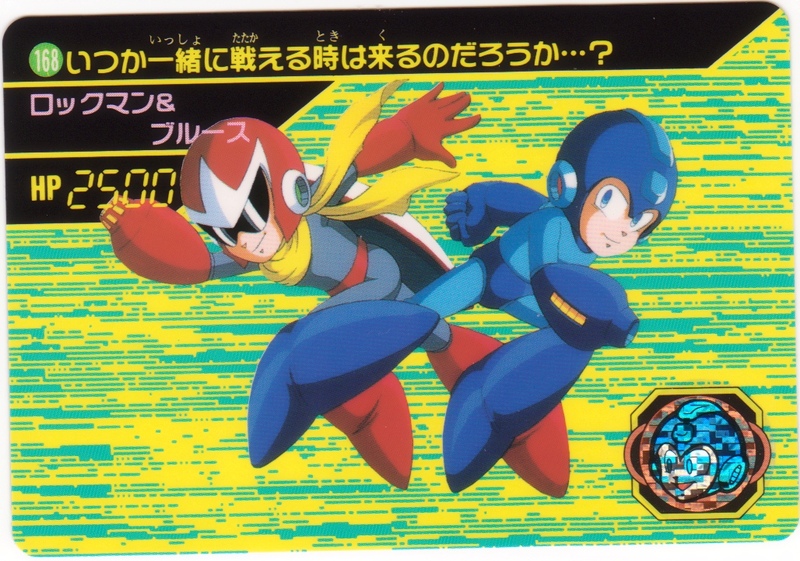 And of course, where would Rockman be without his wayward brother, Blues? Rock may not know the full extent of their connection, but there’s no doubt about the strong bond he shares with that mysterious red wanderer who always arrives in the nick of time to help him out of a jam. 168. Perhaps someday the time will come when they fight side by side…? Something fans had been waiting many long years to see! Though one could argue The Power Battle or other appearances, I believe that time was best embodied in the latest classic game, Rockman 10. That trailer still gets me pumped! 2 Comments to "Carddas Countdown Celebration: 10, 9…"
I would think that the idea of both knowing they’re brothers is too prevalent in our region already to bother changing. But then I didn’t think they’d replace “Rock” with “Mega” in Powered Up, either. Not mentioning it one way or the other just avoids the subject all together, so that’s one way to do it. But if the Japanese games ever do make the big revelation for Rock, that’s going to come out sounding strange indeed.